Two months ago, reports claimed that Story of Yanxi Palace <延禧攻略> stars Wu Jinyan (吴谨言) and Hong Yao (洪尧) were in a relationship after they were spotted vacationing in Bali together. 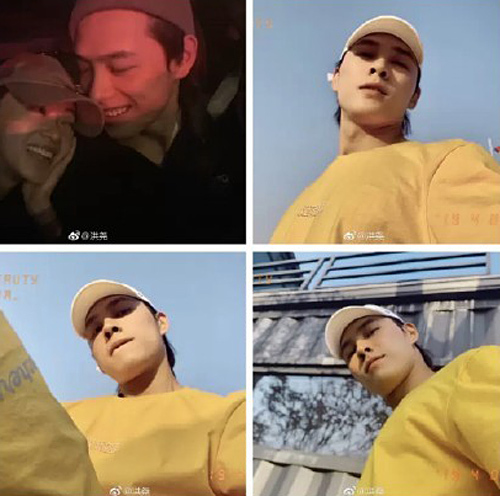 She had denied the rumors then, but with Hong Yao accidentally posting a photo of themselves cozying up on his social media yesterday, it is highly likely that their dating relationship is true. Collaborating with each other again in upcoming drama, Standardized Life < 标化人生>, Jinyan and Hong Yao were believed to have started dating then. A netizen had previously revealed that they spotted them vacationing in Bali together, but noted that it seems they’re still in their early stages of dating. A photo of them in matching couple t-shirts and the same earrings and rings also surfaced. The pair’s latest photo, in which Jinyan was seen leaning against Hong Yao while he looked down at her lovingly, caused another round of wild speculations. The 27-year-old actor had posted the photo of Jinyan and himself along with three of his selfie photos. It may have been a slip-up, as he quickly deleted it soon 23 minutes later. There has yet to be any response from Hong Yao and Jinyan in regard to the matter, but it may come soon, as netizens are already discussing and waiting for confirmation. I don’t why, but i can’t stand watching this Hong Yao guy. His smile is so verneer. Both aren’t the best looking people in the world but decent on screen presence..